New Jersey has become the second state, after California, to ban “conversion therapy,” which seeks to change the sexual orientation of gay minors. Republican Gov. Chris Christie signed the bill into law on Monday after it passed both houses of the state legislature in June. 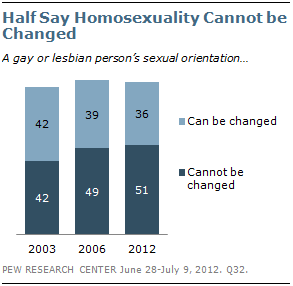 A 2012 Pew Research Center survey found that roughly half of Americans (51%) say that a gay or lesbian person’s sexual orientation cannot be changed, while 36% say it can be changed. In 2003, opinion on this question was divided, with 42% saying one’s sexual orientation can be changed and an equal share (42%) saying it cannot. Christie, who is reported to be considering a presidential run in 2016, has said that he believes people are born gay and that homosexuality is not a sin. A 2013 Pew Research survey shows that public opinion is still divided on these questions. Meanwhile, 45% of Americans say homosexual behavior is not a sin and 45% say it is a sin. Among U.S. Catholics, a group that includes Gov. Christie, 53% say homosexual behavior is not a sin while 33% say it is a sin.